learn how to wear fun make up in the year 2013. As of course you already know, because you’re savvy and in-the-know, emerald green is the color of the year 2013. That’s at least according to Pantone, (the color bosses of the universe) and that’s a-okay with me. Green is one of the pretty great colors of the rainbow, and I personally cannot get enough. We really don’t need to talk about the fact that my 3 main purses are varying shades of the color green, and that I own a whole host of green eye liners, eye shadows, and bright nail polish. Me and green, we have a thing. So how does my emerald green obsession help you with your resolutions? Easy. I’m here to help you step back from the ledge. 1. The main tricks to wearing any new trend or bold look is to tread lightly. Let’s say for example you decide you’re going to wear some green eye shadow out to dinner tonight, just for funsies. That’s the only bit of it you should wear. No matching nail polish, shoes, purse, jeans, (or hair). It’s too much – leave the match y-matchy to the under 4 twin set on the playground, the rest of us are too old. 2. 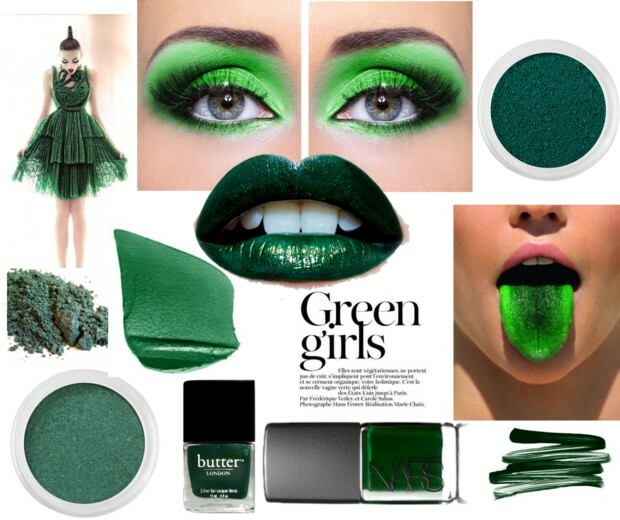 If you are going to wear a spectacular shade of green on your eyes, wear complementary make up on the rest of your face. Choose some colors that sit next to green on the color wheel and make them work for your face. If you go opposite the color wheel things will get a little nuts. No thank you, please and yes, and please. 3. Similar to rule #1, let the color be bold all by its lonesome. You don’t want to vamp up your eyes with bright emerald and try to rock some hot pink lipstick and bronzer all at the same time. People will think you’ve gone missing from a Duran Duran video set, to be aired on MTV back in time (because waaaaay back when, they used to show what we call music videos on MTV, for serious). Yes, we’ve got this? You’ve got this, because you’re surely already rocking a little bit of emerald green eye liner. On the weekends, at the very least. You’re a bit of a rock star like that.